Now you know why Nikola Tesla built a laboratory in Colorado Springs in 1899, right in the central red patch. This map was created at the National Weather Service office in Pueblo, Colo., where its page includes links to more maps for the (48) United States (Florida wins!) and the world. 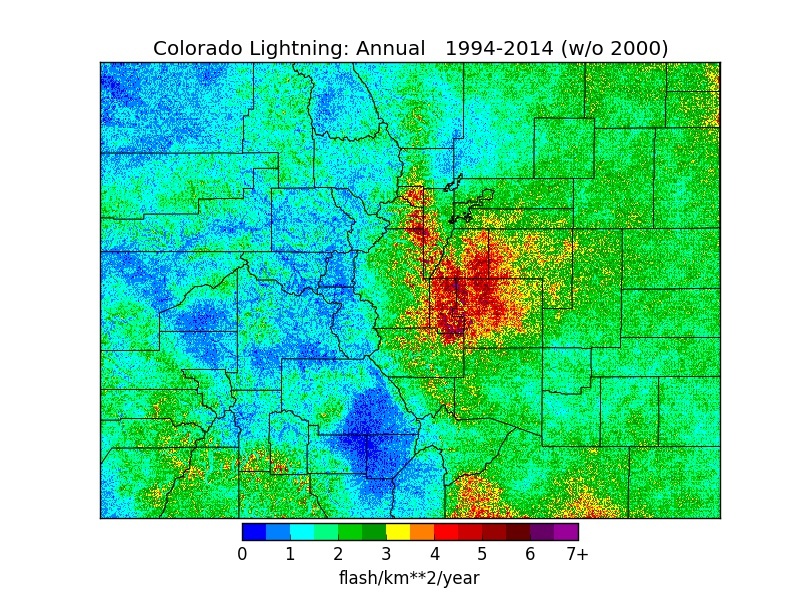 The maps of Colorado and the United Statea show the number of Cloud to Ground (CG) lightning flashes per square kilometer per year. . . . The lightning flash density maps of the world show total lightning activity, that is, Cloud to Ground (CG) lightning plus In-Cloud (IC) lightning. 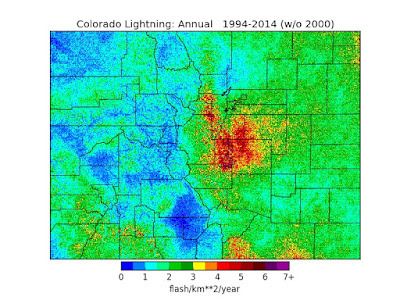 All lightning flash density plots for the state of Colorado are calculated with a very high spatial resolution of 0.01 degree latitude by 0.01 degree longitude squares. This corresponds to anapproximate resolutionof 1 km squared for the state of Colorado. Data is from 1994 through 2011, excluding 2000. M. and made up our term, the "Pike's Peak Swirl," when thunderstorms would interfere with our old summer job of censusing owls for the Bureau of Land Management in areas south and southeast of Pike's Peak. Or as the Coloado Springs Gazette puts it, "Why Is Pike's Peak a Giant Lightning Rod? Blame Denver. " Moisture from the south tends to circle around Denver and slam back into the Palmer Divide, combining with heat generated by the Pikes Peak massif and its surrounding peaks, said Steve Hodanish, a meteorologist and lightning specialist with the National Weather Service in Pueblo.